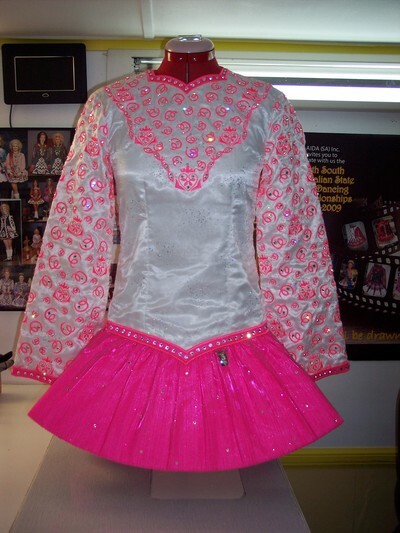 Brillant White Sequined Organza With Hot Pink Sequined Pleated Skirt Champion Dress. Hot Pink Claddagh and Celtic embroidery. Dress is lightweight and is slim fitting. Shawl is embroidered in Gaelic: Dance with your Heart. Full cotton lined and bright yellow lined skirt. In perfect condition, no stains, marks or smell. Always stored flat and in smoke free home. Comes with headband, new leotard and bloomers. There are over 400 Swarovski Crystals on the dress. Must sell as dancer has outgrown. Asking Price: AUD$890-00. Shipping costs are included in the asking price for worldwide shipping. Will accept returns and refund the cost of the dress, buyer to pay all shipping costs.